Red Carpet Studios Birdie in the Woods Birdhouse, Billy Face. 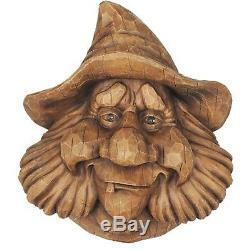 Sculpted face bird house resembles an authentically carved wood piece and adds charm to your yard. Measures approximately 9-inch wide x 10.5-inch tall x 5-inch deep. Cast of quality resin and hand painted for appeal; long lasting beauty and durability. Characteristically goofy elf-look complete with pointy hat; fluffy beard and snaggletooth; bird enters house through nose. Easily mounts to wall or tree with single nail; contains cleanout hole in back. A distinctive and unique way to add your individual personality to your front or back yard. Birdie in the Woods intricately sculpted old man and elf face- style bird houses resemble an authentically carved wood piece, but are crafted from resin for long lasting beauty and durability outdoors. Can be easily hung on wall or fastened to tree by single nail. Cleanout holes in back of sculpture. Measures approximately 9-inch wide x 10. 5-inch tall x 5-inch deep. In the year 2000, Red Carpet Studios introduced garden terrariums. Since then, we have continued to explore the tranquility and allure of the outdoors and have expanded our line to include birdhouses, feeders, chimes, wind spinners, garden stakes and a collection of kinetic garden décor. We strive to introduce new and exciting products to enhance your garden and yard space. Count on RCS for all of your eye-catching decorative outdoor needs. You may return items in its original condition within 30 days. The item "Red Carpet Studios Birdie in the Woods Birdhouse Billy Face" is in sale since Tuesday, November 14, 2017. This item is in the category "Home & Garden\Yard, Garden & Outdoor Living\Bird & Wildlife Accessories\Birdhouses". The seller is "mightygalaxy" and is located in US.